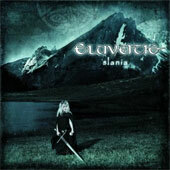 Eluveitie’s latest full length release, Slania, is folk metal with less emphasis on the peasants, feudal lords, and operatic vocals that often cause listeners to shy away from the genre. The group combines a sound similar to bands like Darkest Hour with traditional folk elements such as pipes, whistles, flutes, and a type of fiddle called the hurdy gurdy. This combination has led to a palatable segue album for fans with metal tastes looking for another avenue of music to explore. Pure instrumental tracks are used sparingly as key transition points throughout the album. These transitions are most successful with the intro, “Samon”, and the seamless lead in from “Giamonios” to “Tarvos”. The only objection I have is with the placement of “Anagantios” midway through the thirteen tracks. The positioning makes it difficult to jump back into the fast and heavy sound of the heart of the album. The song’s beauty and sense of closure would have a stronger impact as an outro in replacement of the acoustic remix version of “Samon”. Eluveitie has produced an album that is both heavy and melodically catchy without falling into cookie cutter status. Songs like “Bloodstained Ground” and “Tarvos” highlight the uniqueness of the band’s talent. With this album, the group has proven you don’t need to be a level 15 paladin to bang your head to a pipe breakdown or a flute solo.